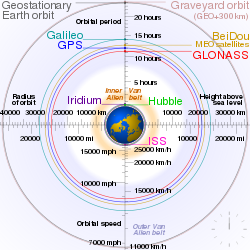 ^ "What Is an Orbit?". NASA. David Hitt : NASA Educational Technology Services, Alice Wesson : JPL, J.D. Harrington : HQ;, Larry Cooper : HQ;, Flint Wild : MSFC;, Ann Marie Trotta : HQ;, Diedra Williams : MSFC;. 2015-06-01. Retrieved 2018-07-08. LEO is the first 100 to 200 miles (161 to 322 km) of space.